Begin by brainstorming with your client what it takes to be a good friend, or what they look for in a friend. Just replace their list with ingredients for your cookies (or brownies, scones, muffins, whatever). 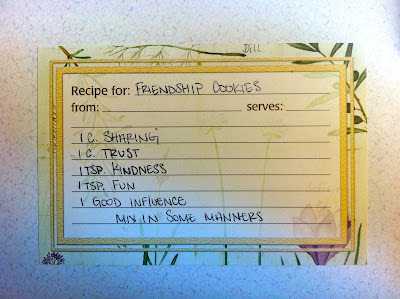 The kiddos love the wording you can use for this activity, "a cup of trust and a pinch of silly mix together to make the perfect friendship cookie!" You can also use this to talk about friendship characteristics that are important to them and that there is more than one quality to look for in a friend. Then turn it around and ask them if they have these same qualities. Plus then you get to eat some cookies, win-win!